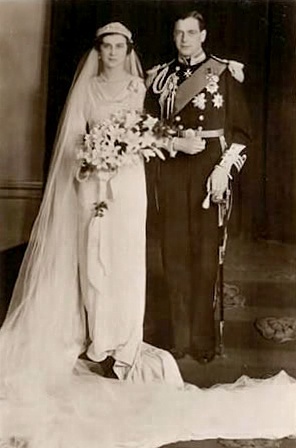 They were a dazzling pair, Sir Henry "Chips" Channon wrote, and he wasn’t the only one swept away with Marina and George, the royal wedding couple of 1934. She was a chic exiled princess, daughter of Prince Nicholas of Greece and Denmark and the former Grand Duchess Elena Vladimirovna of Russia; he was a handsome prince, son of King George V and Queen Mary. They married in a London decked out in British and Greek flags, with ceremonies first in Westminster Abbey and then again in a private Greek Orthodox ceremony in Buckingham Palace. To no one’s surprise, the stylish and striking Marina married in a gown that was the picture of 1930s glamour. It was designed by Captain Edward Molyneux, a couturier with salons in Paris and London that Marina had worked with in the past. His creation seems simple from afar, with a sheath silhouette and a draped cowl neckline. But the drama is in the details: the trumpet sleeves, the wide train, and most of all the fabric. It's the fabric that brings me to post this dress today, as I can't help but be reminded of another recent dress of intricate silver ornamentation - that of the new Hereditary Grand Duchess of Luxembourg. 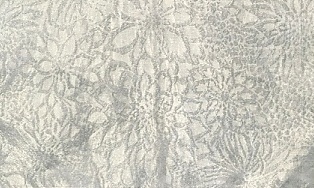 Marina’s gown was made of silver and white brocade with a raised English rose design. Deemed too delicate to sit in storage waiting to be sewn, it was woven in under two weeks in Lyons and shipped tout de suite to London, where a team of seamstresses created the dress. (At the Princess’ request, the seamstresses included a group of Russian refugees as her way of showing sympathy for the people displaced by the revolution in her mother’s home country.) The silver fabric glimmered in the lights on that foggy November day, making quite an impression for the bride. 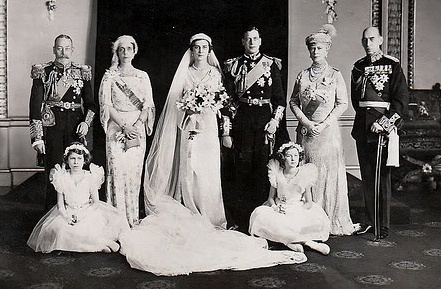 She also glittered with diamonds, becoming a far more bejeweled bride than recent Windsor weddings had seen. 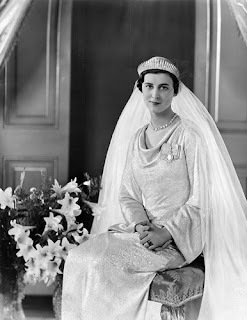 Her long tulle veil was topped by a tiara, still then not a requirement for a British royal bride as we think of it now, which was one of her wedding gifts (and will be our topic tomorrow). 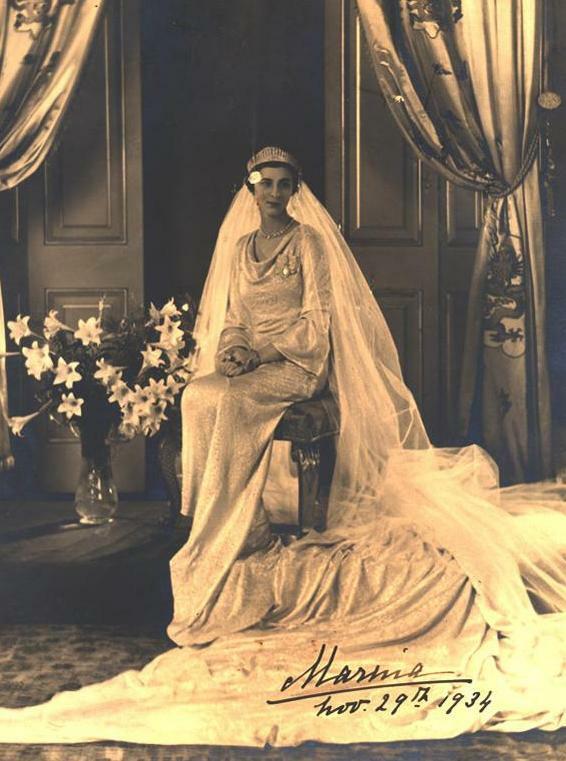 Her large diamond necklace of 34 stones was a wedding present from the King, whose family order she proudly wears in the wedding photographs. The wedding was the start of a life together which is still remembered for its glamour…and its troubles. They had three children, Prince Edward (the current Duke of Kent), Princess Alexandra, and Prince Michael. Michael was born not even two months before his father’s tragic death in an airplane crash in Scotland while serving in the Royal Air Force in 1942. 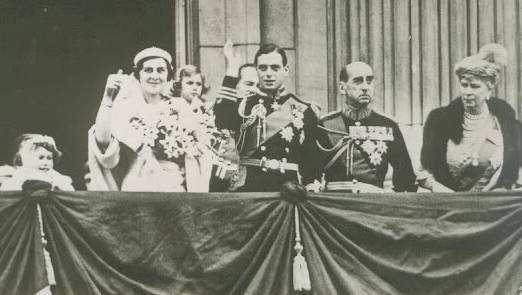 History has marked Marina’s widowhood with talk of her husband’s relationships with other men and her money troubles, set up by the couple’s overspending and lack of funding for their royal life. (She began auctioning off treasures for funding during her lifetime, something which has been continued from time to time by her children.) Gossip aside, Marina served the royal family until her death in 1968. How do you feel about this version of a silver gown?